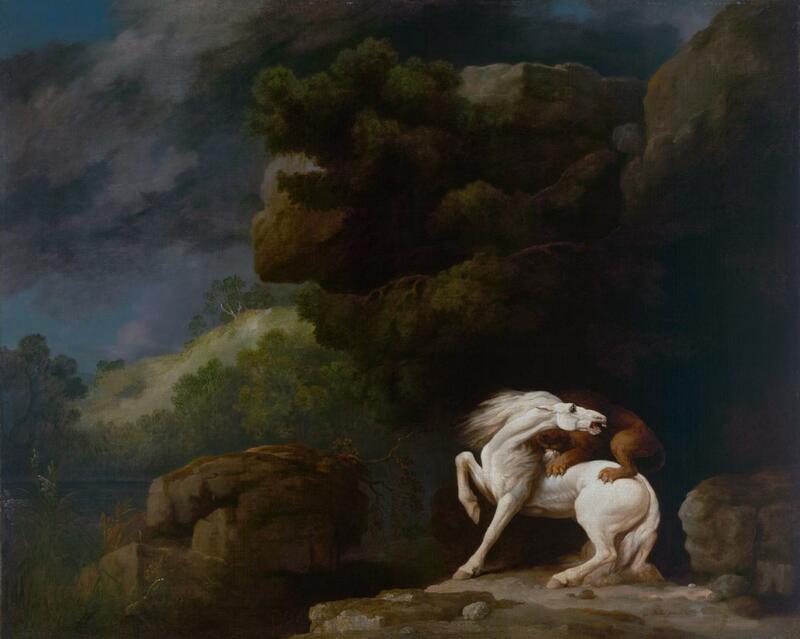 A few eighteenth century paintings caught my attention recently, mostly works of Thomas Gainsborough and George Romney. The thing that connects these portraits is a distinctly contemplative and melancholic mood. 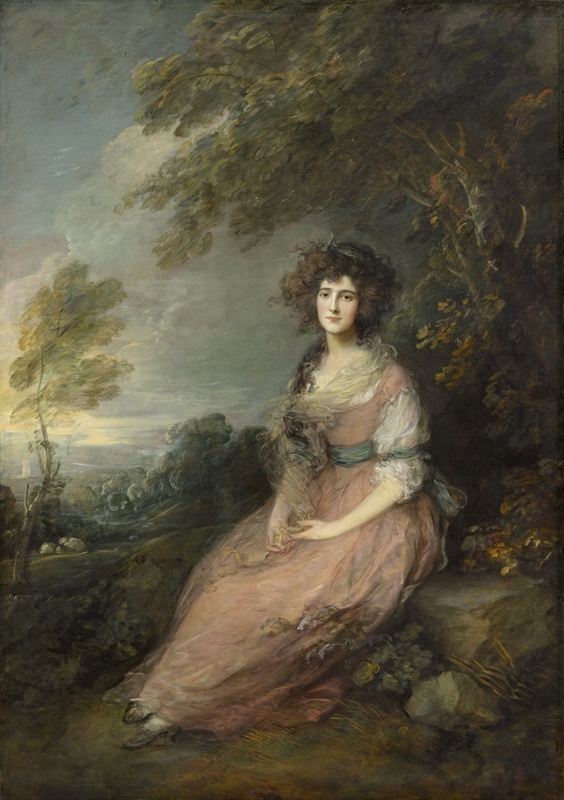 I am mesmerised by Gainsborough’s flickering brushstrokes every time I gaze at this painting. Every detail of it exudes movement, certain sweet turmoil, a sense of anticipation and sadness that something so anxiously awaited might never really occur. The first thing one notices in this painting is the mood of exuberant restlessness: lush and unbridled tree branches dance in the wind, tiny leaves rustle a melancholic hymn in the solitude of the forest glade, her hair and translucent gauze kerchief flutter in the wind. 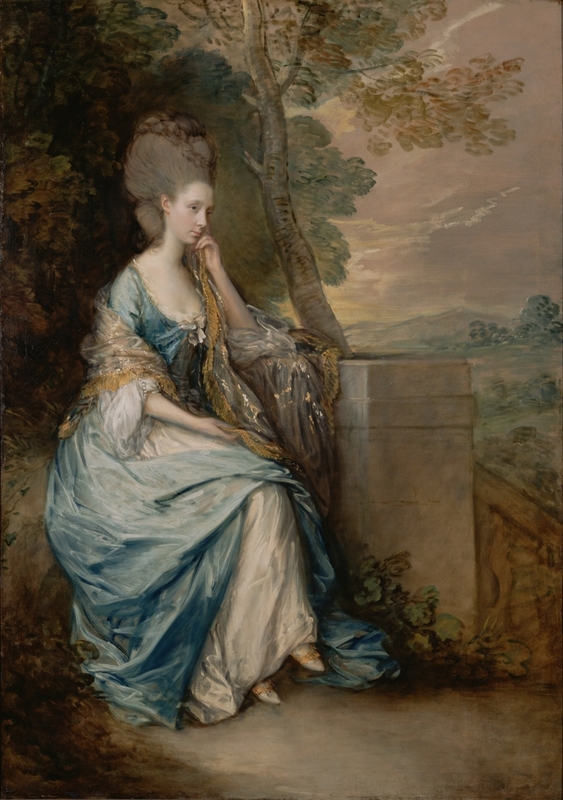 Seems like Gainsborough painted a romantic heroine rather than a bourgeois lady. 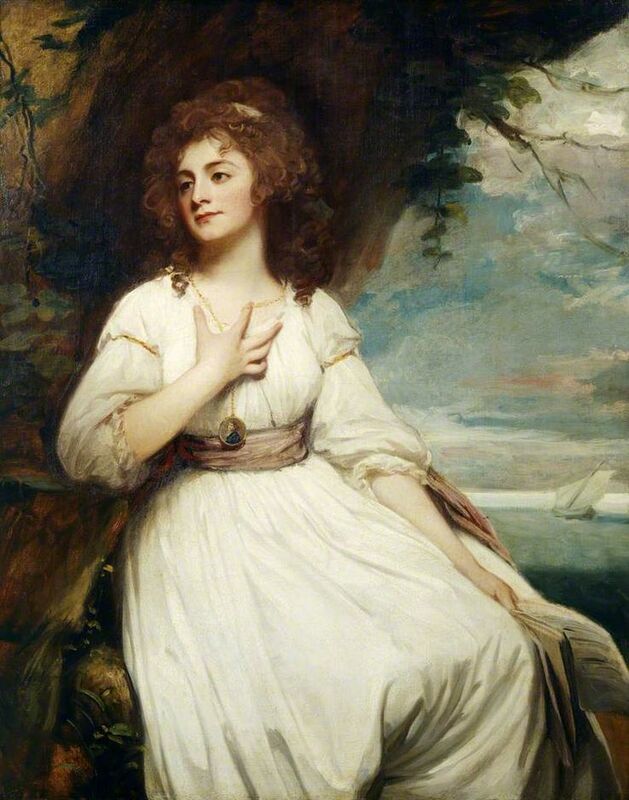 Well, the mood of this painting is distinctly romantic and sublime, but the lady is not a virginal maiden from Horace Walpole or Ann Radcliffe’s novels, but a prominent Georgian era musician Elizabeth Ann Linley. 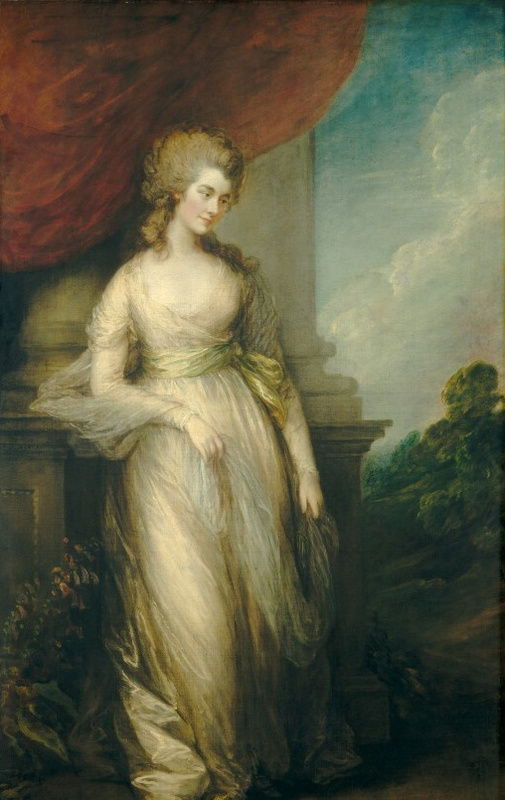 Captured for eternity wearing a salmon coloured dress with muslin sleeves and a blue sash, this pretty, talented and wistful lady died of consumption a few years after this was painted. She was only thirty-eight years old. Not knowing her story, but simply looking at her sad gaze and untamed nature around her, awakens the imagination. A thought occurs: All things must pass (George Harrison). Only art is capable of rising above transience, and Romantics knew it. 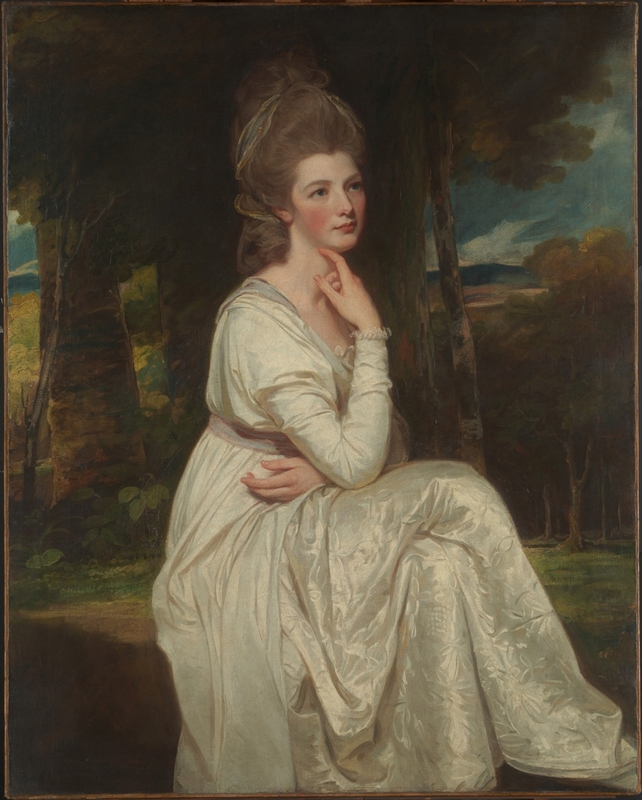 Still, intricate fashion is one of the reason why Gainsborough’s portraits are so beloved and aesthetically pleasing. 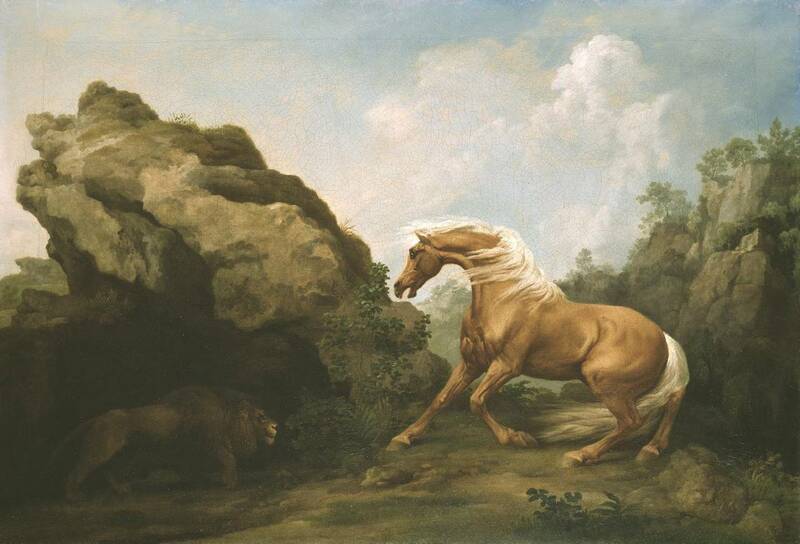 Note the importance of nature in this painting. 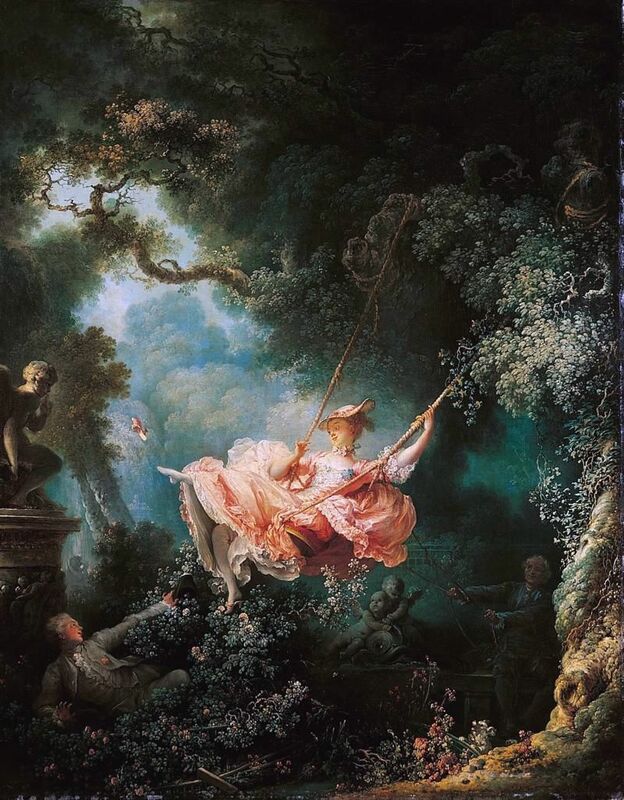 Yeah, British portraits of the time usually had trees and clouds as a backdrop (unlike French who preferred being painted indoors to showcase their fine furniture) but here nature is almost as important as the lady. 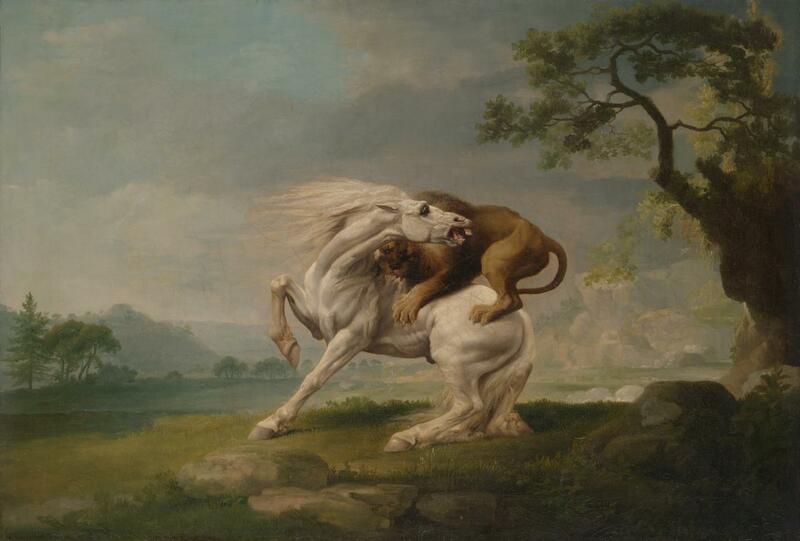 ‘Nature’ meant many things to the Romantics. As suggested above, it was often presented as itself a work of art, constructed by a divine imagination, in emblematic language. 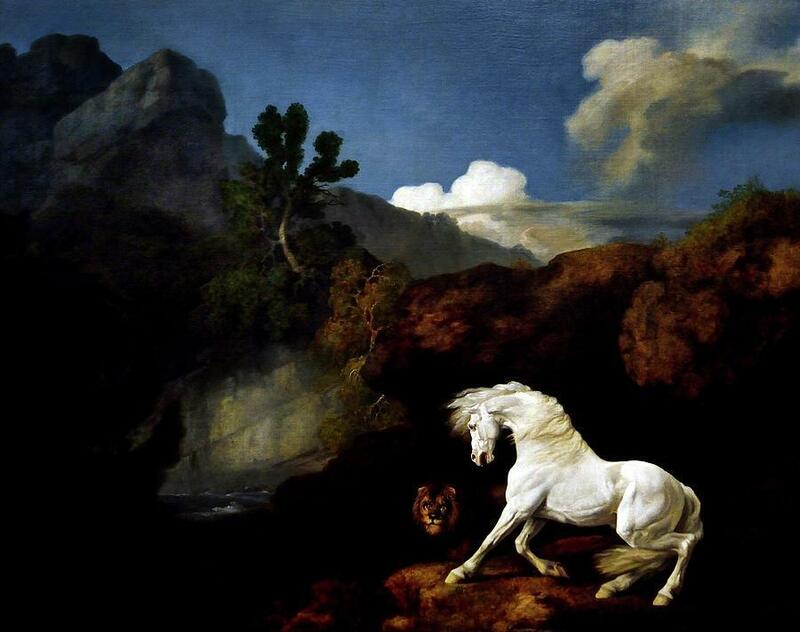 (source) This emphasis on nature is reminiscent of a literary movement that was just at its beginning at the time this was painted – Romanticism. 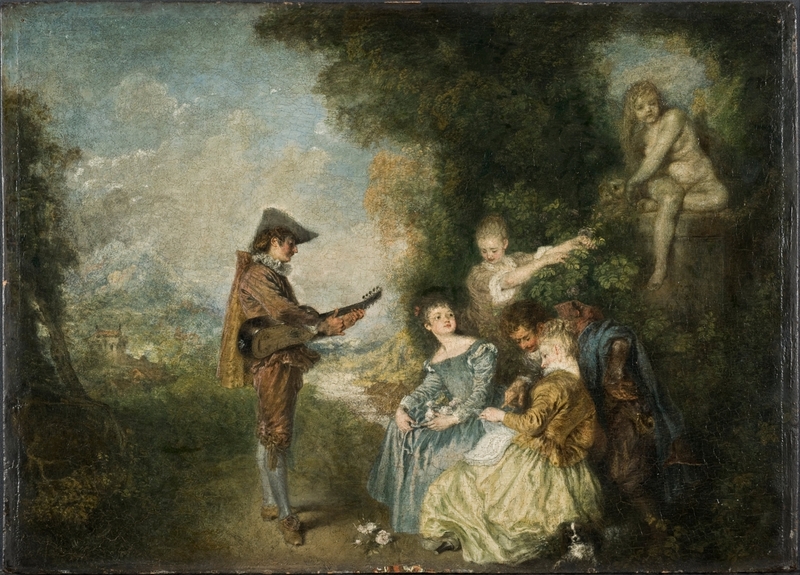 To put this painting in the historical context and connect it to Romanticism: Goethe’s Sorrows of Young Werther were published in 1774 and Rousseau’s Confessions in 1782, Wordsworth would have been a mere 15-17 year old lad, William Blake published his Poetical Sketches in 1783, and Lord Byron, being born in 1788, wasn’t even alive at the time. 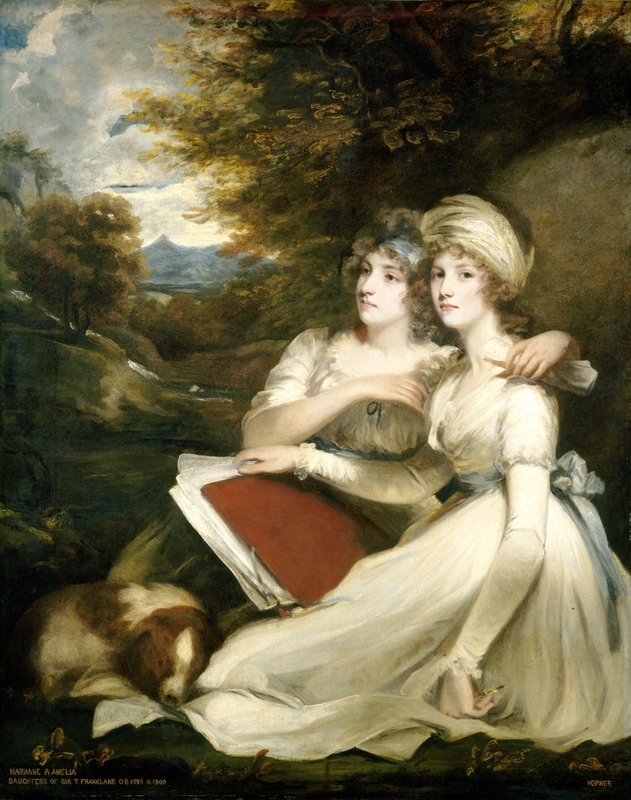 This painting is a slight contrast to Gainsborough’s more Neoclassical-style paintings of the previous years. One could argue that he captured the sensibility of the time, or he simply indulged his love of painting countryside scenery.